Wholesale Direct Restaurant Supplies is now stocking BioPak Rainforest2Reef BioCup Art Series! 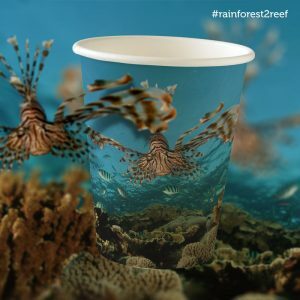 How BioPak Rainforest2Reef BioCup Art Series has teamed up with Rainforest Rescue and Great Barrier Reef Legacy to bring you the #rainforest2reef Art Series. The series features 17 artists whose work celebrates and raises awareness on the importance of protecting the ancient and biodiverse Daintree National Park and the Great Barrier Reef. The Wet Tropics and Great Barrier Reef World Heritage Areas in far north Queensland are of international significance. Yet both areas are under threat from climate change. #rainforest2reef will showcase the diversity and connectivity of these two amazing areas. 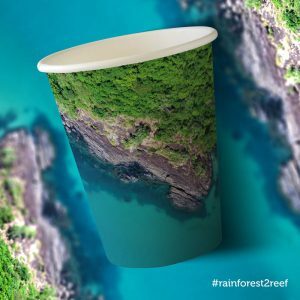 This BioCup Art Series will features 17 different artists and artwork on our compostable BioCups to showcase the beauty, biodiversity, heritage and inter connectivity between the Daintree Rainforest and the Great Barrier Reef. David Brayshaw has been visiting the Great Barrier Reef for many years. He is invested in promoting the extraordinary beauty of the Reef in attempts to mobilise further protection and care for its future. “We’re honored to be working with such a diverse range of artists who can help tell the story of these special places and why they need protecting,” says Rainforest Rescue CEO Julian Gray. He continues, “The BioPak cups are a fantastic way to bring the rainforest and reef closer to people’s daily lives”. To purchase single wall bio Art cups click here. BioPak have already committed 1% of profits to Rainforest Rescue annually and together with their customers have adopted 9,000 trees and purchased three hectares of rainforest in the Daintree National Park since 2012. All BioCups are lined with Ingeo™ bioplastic and made with sustainably sourced paper from managed plantations. Ingeo™ bioplastic is made from plants, not oil and it’s production emits 75% less CO2 emissions compared to conventional plastic. They further reduce your carbon footprint as they are carbon neutral!